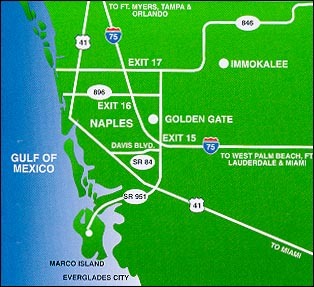 Two airports serve the Naples and Marco Island areas with major airlines -- the Naples Airport in the heart of town and Southwest Florida International Airport 35 miles to the north in nearby Fort Myers. If you're coming by car, Interstate 75 provides a four-lane, direct route for drivers from all points north and from either coast of Florida. The interstate puts us less than two hours from Miami and Fort Lauderdale, three hours from Palm Beach and Tampa and only four hours from Orlando.